Come walk with me is a small client-focussed business that exists to help you explore and get the most out of the beautiful British countryside. Established in 2014 by British Mountaineering Council accredited Mountain Leader, Ian Howells, we specialise in guided walks across some of the most spectacular landscapes in the UK, including the Peak District, Lake District, Snowdonia and National Parks of Yorkshire. Whilst we offer an extensive repertoire of classic walks showcasing natural, cultural and historical highlights, we are also more than happy to work with you to create a specific walk or itinerary tailored to your particular interests and requirements. One of my earliest memories is of wild swimming in an icy Welsh river, my face smeared with bilberry juice and my mind alive with imaginings of the legionnaires who’d trod the Roman Steps many centuries before me! Since then I’ve been obsessed with exploring. 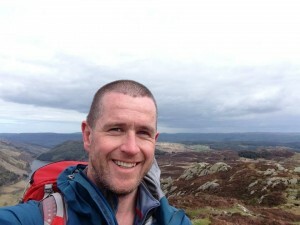 After leaving university and a number of years travelling the world I opted to make the North West my home .I now have over 15 years of experience walking in the North of England and Wales and have worked for organisations including the YHA, Prince’s Trust, Groundwork Trust and EF Travel. This experience makes me the perfect guide to help you get to the very heart of the British countryside. Some of my favourite walks include; The Wainwright Coast to Coast route, the Crib Goch ridge onto Snowdon, the Fairfield Horseshoe and the Kinder Trespass route. In addition to the UK I have walked extensively in New Zealand, the USA, South Africa and Europe. Having recently retired from rugby I can now dedicate myself to my other passions which include skiing, photography, travel books and learning to climb! In addition to my Mountain Leader qualification I hold a current First Aid certificate (with emphasis on outdoors activity), am DBS (formerly CRB) checked and hold a D1 driving license. What is your facebook page called for me to follow. just seen article in Advertiser Sale &;Altrincham. Here is the link Caroline,https://www.facebook.com/comewalkwithmeuk, thanks for getting in touch 🙂 Hope you enjoy the page!